Learn German and meet children and teens from all over the world. Have an enjoyable stay while experiencing the culture in the most scenic regions of Germany, with an extracurricular program packed with sports, music, the arts and plenty of fun activities. The Goethe-Institut offers all of this in its courses for children and teens. The price includes the transfer to and from the indicated airports only on the official arrival and departure dates between 7:00 am and 6:00 pm. The course price includes the transfer to and from the indicated airport(s) only on the official arrival and departure dates between 7:00 am and 6:00 pm. To get the young learners in our teen courses off to a running start, we begin with a placement test. That helps to make sure that everyone is placed in the right course level. Learning German at the Goethe-Institut means actively experiencing and using the language in pairs and in groups, for example through role plays, with interviews or in projects. The lessons are suited to the various age groups and contain plenty of variety. Speaking, listening, reading, writing and grammar are linked in a meaningful way, quickly familiarizing the young learners with the German language. The teaching language is German, of course. In the leisure time program, the participants have enjoyable and informal opportunities to try out what they are learning in the lessons. An integral part of the teaching program are the excursions with the teachers to learn about Germany and its people. Immersion in a German-speaking environment, combined with our effective teaching methods, will ensure more fun for the learners as they see for themselves how quickly they are picking up the language. With our varied and action-packed leisure program, boredom doesn’t stand a chance. Every day our team of counselors offers a wide range of sports as well as creative, musical or cultural activities. The boarding schools where the courses take place are situated in scenic areas and have attractive indoor and outdoor sports facilities. With full supervision, the participants can play soccer, handball, volleyball, basketball, tennis, badminton, table tennis and billiards, among other sports. They can also go cycling, hiking and swimming. Depending on the course location, various special activities such as riding, golf, rowing, canoeing, sailing, climbing and much more may be available. Creative activities such as theater, mime, painting, pottery, crafts, musical performances, film making, photo contests, and writing the course blog are always a big part of our courses – not to mention games, barbecues, disco nights and movies. We take our learners to plenty of places, for example to see the local sights and museums, exhibitions, concerts, theater and movies. We also organize guided outings. That is an excellent way of getting to know Germany. 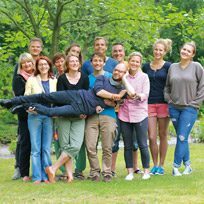 Our young learners courses take place at respected boarding schools, sports academies, youth guesthouses and conference centers in Germany's most scenic regions. The classrooms and dormitories are situated on a campus along with the sports facilities and green spaces. The schools generally have several common rooms, games rooms, music rooms, and recreational and sports facilities, both indoors and outdoors. In the boarding schools double rooms and dorm-style multi-bed rooms are available with a shower and WC. Boys and girls are accommodated separately. Rooms are shared by children and teens of the same age from different countries. In this international setting they are quick to make friends. Boys and girls stay on separate floors or in different houses. Depending on the course location, showers and toilets are located in each room or on the same hallway. Towels and bed linen are provided and are changed on a regular basis. Full board means three substantial meals a day with plenty of variety, including a warm midday meal or a packed lunch on excursion days. It also includes a selection of refreshments and snacks during course breaks and in the afternoon. To leave enough time for the leisure activities in the evening, the evening meal is relatively early on some days and may take the form of a cold buffet. On the arrival day, the meal plan begins with lunch or dinner, and on departure day the final meal is breakfast or lunch, depending on the departure time. The children and teens have their meals together and afterwards clear the tables. Vegetarian meals and dishes without pork are available at all mealtimes. We regret that we cannot offer Halal cooking or special mealtimes during Ramadan. Please let us know in advance of any special dietary habits (vegetarian meals, no pork, etc.) so that the boarding school kitchen can prepare accordingly and take your child's needs into account – especially in case of serious food allergies, etc. Our course coordinators have plenty of experience in working with children and teens. On the campus they are responsible for organizing the lessons, the sports, culture and leisure-time program, and also for health and safety. They are available to the course participants and their parents at all times for any questions and suggestions, and are always ready to help or provide advice. Parents can contact the course coordinators by e-mail or telephone. The young participants in the Young Learners Program benefit from the expertise and qualifications of our teachers. Each class has its own class teacher. The lessons, with a maximum class size of 16, are planned by the teachers with the age group in mind. The activities are varied, with plenty of changes of pace. Classroom activities take the form of a playful, interactive process. Naturally our teachers respond to individual abilities and learning objectives and are pleased to help when learners have special requests. Our counselors are there for the course participants 24 hours a day. They plan the sports, cultural and leisure-time activities with the participants' wishes in mind. The counselors are available to deal with all everyday questions and concerns that arise during the course. They are handpicked by the Goethe-Institut for these courses and have plenty of experience in working with children and teens. On average, at least one counselor is available for a maximum of 16 course participants. The younger the participants, the more intensive the support by the counselors. This ensures the best possible leisure-time program and the right level of supervision.